This page describe a range of bicycle accommodation types for on-street and off-street application. 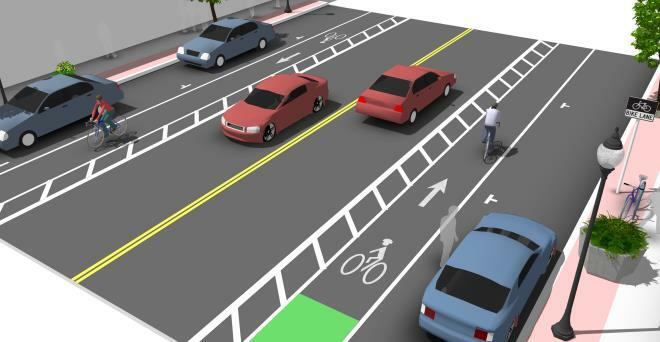 Bicycle facility selection depends on a variety of factors including motor vehicle speeds and volumes, topography, adjacent land use, available right of way, and expected bicycle user types. Children and their parents/guardians may prefer lower stress bikeways such as bicycle boulevards, buffered bike lanes, cycle tracks, and multi-use paths compared to shared roadways without traffic calming features or conventional bike lanes. A marked shared roadway is a general purpose travel lane marked with shared lane markings (SLM) used to encourage bicycle travel and proper positioning within the lane. In constrained conditions, the SLMs are placed in the middle of the lane to discourage unsafe passing by motor vehicles. On a wide outside lane, the SLMs can be used to promote bicycle travel to the right of motor vehicles. In all conditions, SLMs should be placed outside of the door zone of parked cars. Marked Shared Roadways may be signed with Bike Route and/or May Use Full Lane signage. Marked Shared Roadways may be signed with “Bike Route” and/or “In Lane” signage. Refer to the NYSDOT Shared Lane Marking Policy (TSMI 13-07) found here. 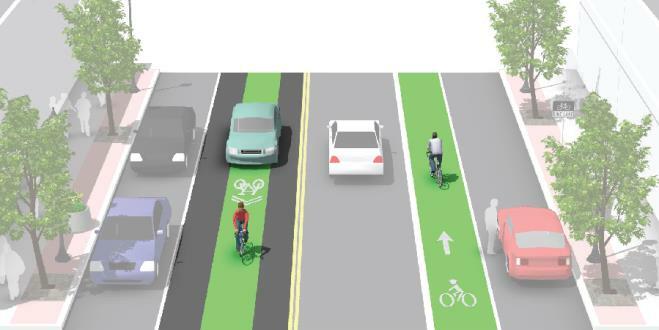 Bicycle lanes designate an exclusive space for bicyclists with pavement markings and signage. The bicycle lane is located adjacent to motor vehicle travel lanes and bicyclists ride in the same direction as motor vehicle traffic. 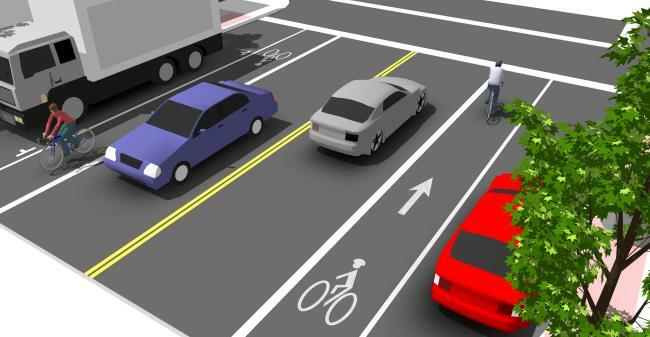 Bicycle lanes are typically on the right side of the street (on a two-way street), between the adjacent travel lane and curb, road edge or parking lane. 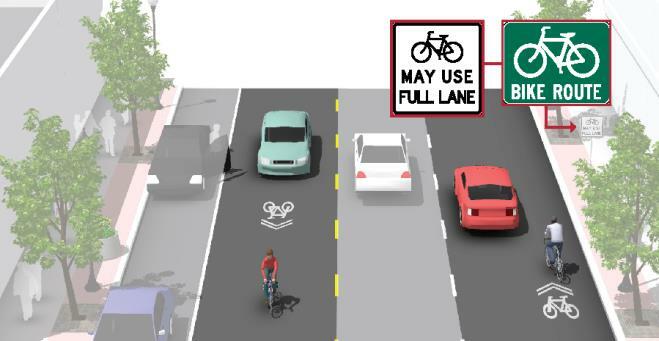 Buffered bicycle lanes are conventional bicycle lanes paired with a designated buffer space, separating the bicycle lane from the adjacent motor vehicle travel lane and/or parking lane. 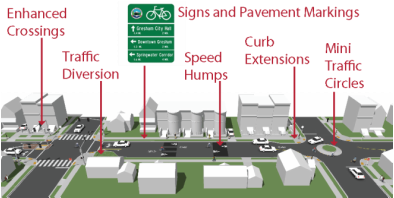 Bicycle boulevards are low-volume, low-speed streets modified to enhance bicyclist comfort by using treatments such as signage, pavement markings, traffic calming and/or traffic reduction, and intersection modifications. These treatments allow through movements of bicyclists while discouraging similar through-trips by non-local motorized traffic. Streets should contain a minimum of three traffic calming enhancements if they are to be considered bicycle boulevards. Colored Bike Lanes and "Super Sharrows"
Colored pavement within a bicycle lane increases the visibility of the bicycle facility. 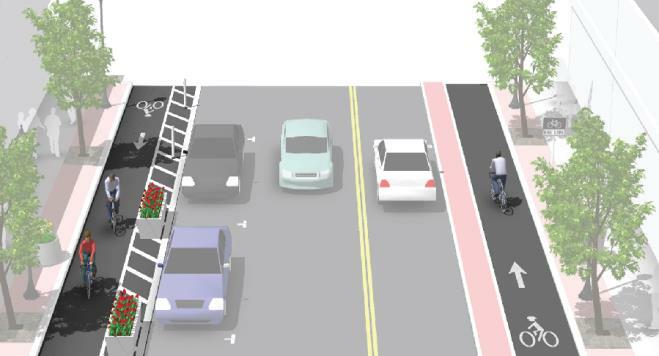 Use of color is appropriate for use in areas with pressure for illegal parking, frequent encroachment of motor vehicles, clarify conflict areas, and along enhanced facilities such as contra-flow bicycle lanes and cycle tracks. 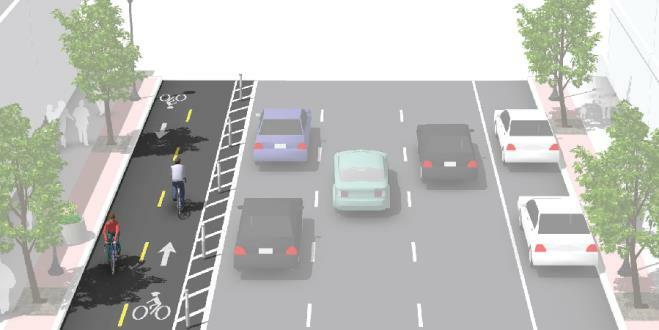 Color has also been used in conjunction with shared lane markings to create a “lane within a lane” or “Super Sharrows” to further clarify proper bicyclist positioning on shared roadway streets. One-way cycle tracks are physically separated from motor traffic and distinct from the sidewalk. Cycle tracks are either raised or at street level and use a variety of elements for physical protection from passing traffic. They are typically implemented on roadways with higher vehicle volumes and/or speeds. Driveways and minor street crossings are a unique challenge for cycle tracks and require extra consideration. 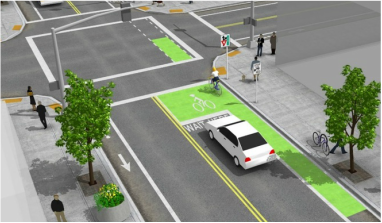 Bike boxes are used at signalized intersections to allow cyclists to wait in front of queued vehicles. This allows cyclists to remain visible and to travel through the intersection before vehicles. The bike box is a green color, easily visible to motorists. It is located behind the crosswalks. Caution should be used when using a bike box when the intersection is located at the bottom of a steep grade. Multi-use paths may be used by pedestrians, skaters, wheelchair users, joggers and other non-motorized users. These facilities are frequently found in parks, or as neighborhood cut-throughs to shorten connections and offer an alternative to busy streets. Multi-use paths should be minimum of 8 ft wide for two-way bicycle travel and is only recommended for low traffic situations. 10 ft is recommended in most situations and will be adequate for moderate to heavy use. 12 feet is recommended f﻿or heavy use with high concentration of multiple users. A separate track (5’ minimum) can be provided for pedestrian use. When striping is required, use a 4-inch dashed yellow centerline stripe with 4 inch solid edge lines. Solid centerlines can be provided on tight or blind corners and on approaches to roadway crossings. For more detailed information on multi-use path design see: AASHTO's Guide for Development of Bicycle Facilities (2012).